W&L Senior Art Show on Exhibit at Staniar Gallery A reception for the artists will be on March 30 at 4 p.m. in Wilson Hall’s atrium. 2017 senior artists (l-r) Wilson Miller, Olivia Sisson, Jack Blair, Alice Cannon, Amirah Ndam Njoya and Matthew Barton. 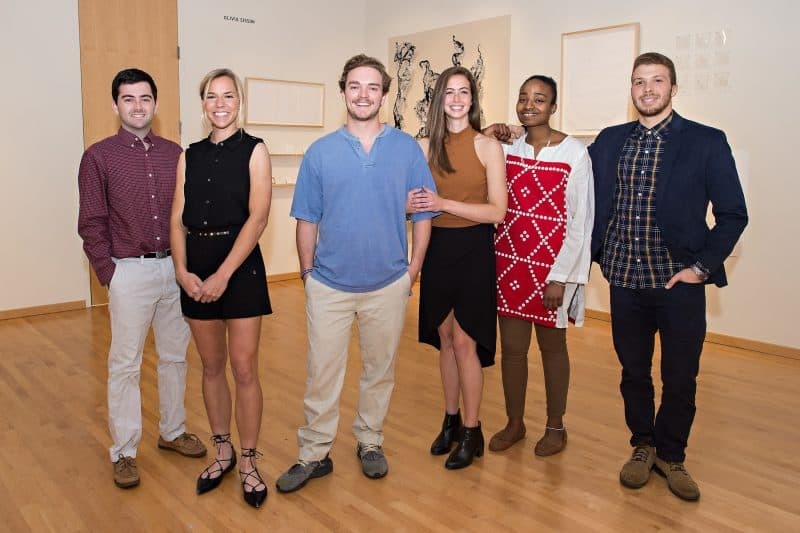 Six Washington and Lee University studio art students will present their senior thesis work in an exhibition at Staniar Gallery that runs from March 27-April 7. A reception for the artists will be on March 30 at 4 p.m. in Wilson Hall’s atrium and is open to the public. Each spring, Staniar Gallery showcases work by the Art Department’s graduating studio majors in an exhibition that is the culmination of a yearlong thesis project to be presented in a professional setting. This year’s show features a variety of media. Matthew Barton explores his family’s history in a series pairing historical images of regional rivers with his own photographs. Jack Blair’s colorful collages are inspired by street art and graffiti. Alice Cannon’s postcard-sized paintings depict views of her native state of Florida that tourists don’t visit. In her large-scale paintings, Amirah Ndam Njoya focuses on portraiture, assimilating the colorful patterns of fabrics from her home in Cameroon. Wilson Miller will present his works on paper that examine the life cycle of tree leaves. Olivia Sisson’s prints, drawings and collages are informed by her lifelong affinity for collecting objects for the purpose of empirical observation.